The BalusC Code: OmniFaces 2.0 released! I use JSF 2.2, latest web server etc. but don't want to use CDI because I have Spring 4.1 in my app. 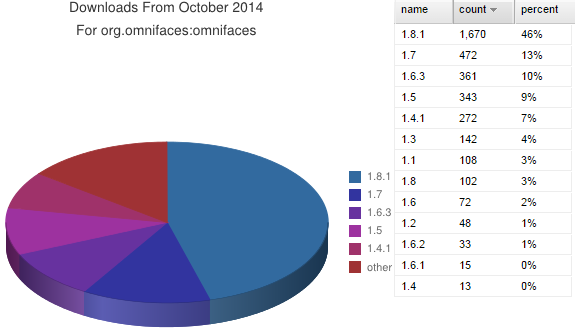 I believe there is about 50% of OmniFaces users in the same situation (guessing from Spring market share). Spring essentially does the same thing as CDI so I am definitely not going to duplicate my libraries and knowledge. OmniFaces is a great library. Do you think there could be a branch of OmniFaces 2 for Spring that would replace the CDI dependency with Spring dependency AND perhaps also fill in the gaps that are missing (like support for @javax.faces.view.ViewScoped). I can actually help with that. What do you think? It would be nice to couple the convenience of the @Param annotation and the viewParamValidationFailed tag. Redirecting on validation error would allow me to inject view params without needing to deal with the possibility that they are null or invalid in my bean code.